The idea for this project was born in late 2001 after my first visit to Aida Camp. After seeing for myself the terrible daily hardships endured there and witnessing the dedication of a some of the young people in the camp towards improving the lives of the children in the camp through their newly founded Children’s Center, I wanted to raise money to help the Center provide opportunities of both education and recreation for the kids. With the help of friends in Rome a fund-raising lunch was held at which I spoke about the Camp and Lajee Center. It was here that I first heard about a children’s photo project done some years earlier in the slums of South Africa. If only we could do a similar project for the children of Aida Camp, I thought, give them lessons in the fundamentals of photography and then let them take their own pictures. Then they would be able to show us how they saw their own lives in the Camp; we would be shown their perspective through the lense of their cameras. I was tremendously excited about the idea, but I needed a photographer to put it into practice. It was not until Spring 2005 that I found him. I was by the Wall in Aida Camp when I saw a young man with lots of photographic equipment. We started talking. It soon became clear that he was a professional photographer and deeply involved in the Palestinian cause, so I told him of my dream to do the children’s photo project. His answer was immediate, enthusiastic and unconditional, and so finally the dream was on the way to becoming a reality. Rich began working with a group of Lajee children, aged between 11 and 19, in August 2005 during our annual International Workcamp. He had raised funds in the UK to support the project, and with a bag of cheap cameras, he began teaching the kids some of the basics of photography. Each day in the blazing heat the children went around the Camp photographing people, streets, homes, and every day they looked at the prints of the photos taken the day before and discussed their merits. At the end of 2 weeks, they selected a range of photos from the many they had taken and put up an exhibition in the Boys’ School where we were staying. The show was stunning! We were amazed by what we saw – the quality of the images, views we had looked at before but never really seen, the talent of the children. Visitors to the show could not believe that children who had never used cameras before could produce such high quality works. It was a tremendous success – for the children, for Rich, for all of us. 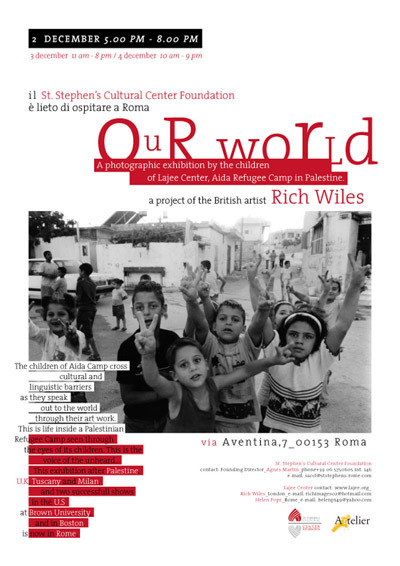 The exhibition “Our World” has subsequently been shown in Palestine, Italy, the UK and the USA. We are very happy and very proud to offer it to you now in Rome.